So we love our traditional French cuisine. And Coq au vin is one of my favorites. A lot of my friends ask me how it is even possible for me to be in the kitchen for 2 hours and not be hungry or tired. I blast music from the speakers (sorry neighbors) and a glass of wine while I cook. It’s pretty awesome. 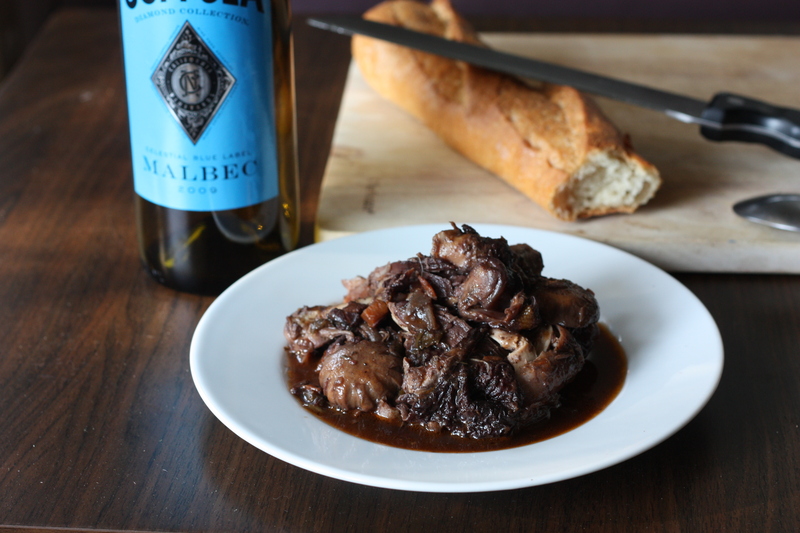 So it was only a matter of time before I remembered to make Coq au vin. It’s really simple and the taste is amazing. Except it taste really really really depends on the wine you choose. Rule of thumb, if you like drinking it, use it. It could be really expensive wine or relatively inexpensive wine. It’s whatever you want. Also this takes more than a day to marinade so keep that mind. 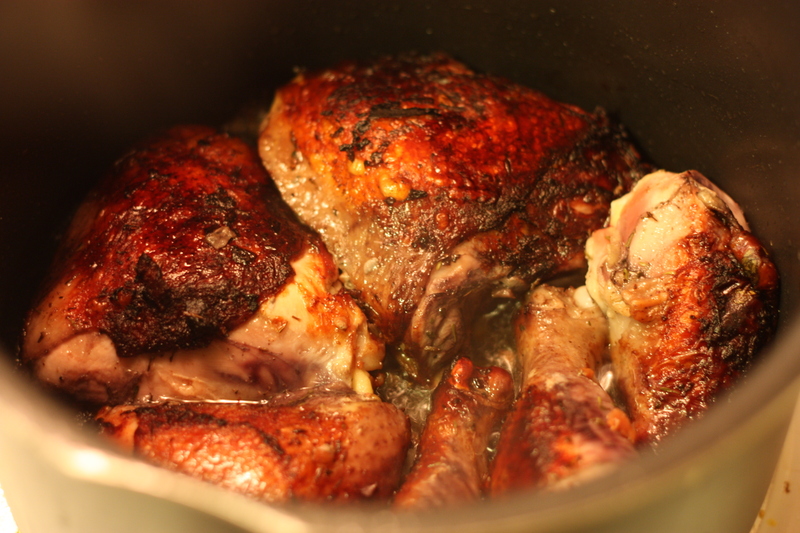 For the chicken, use dark meat, like thighs and drumsticks. I left the skin on, but you can remove it if you want. Some people dust the chicken with flour, but I just seasoned them with salt and pepper. For the marinade, take equal parts of carrots and onions cut in big chunks and put it in your marinade bowl or whatever. It should be big. Then put in half as much celery chunks and two bay leafs, some thyme, little rosemary, and peppercorns. I even threw in some herb de Provence. Just put the chicken in the bowl and drown it in your choice of wine. I went with Malbec. Using so much wine is going to get pricey, but it’s definitely worth it. I used about 3 bottles, 1 for the marinade, 1 for after the marinade, and I drank the one. Now let this marinade in the fridge for 24 hours, or at least over night. When it’s ready, just remove the chicken and sear them in a stew pot like a dutch oven. Once done, just pour in the wine marinade over the chicken, a long with another bottle of wine, 2 tablespoons of tomato paste, and about a cup of stock. I used duck stock because I didn’t have anything else. Cover tight and BBR (Bring to Boil and Reduce heat) and leave to simmer for 2 hours. After two hours, remove the chicken, and reduce the sauce on a simmer for another 20 or 30 minutes to get it really pungent. Once finish, taste for seasoning and put the chicken back. And that’s it! No FFF (Fussy French Food). I served it with a baguette. Enjoy! This entry was posted on March 17, 2012 by rrfoods in Chicken, Dinner and tagged chicken, coq au vin, stew, wine.